In 1970, Heizer finished Double Negative and also executed two large playa drawings. Leasing surface rights from the Bureau of Land Management, he directed motorcycles in a series of circles on Jean Dry Lake . Circular Planar Displacement Drawing and Tangential Drawing  were documented extensively both from the air and from a scaffold erected specifically for that purpose. The twenty-four-foot tower was built on wheels and moved sixteen feet at a time along one of the four-hundred-foot-diameter circles in order to photograph continuously its circumference. 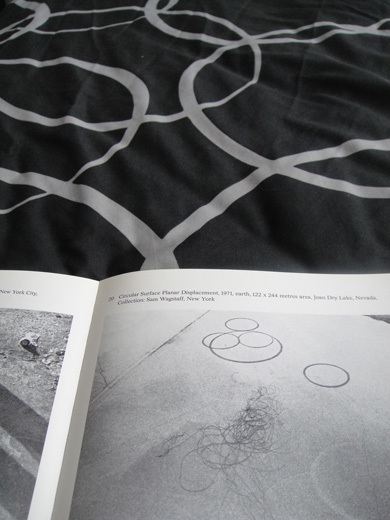 It is not sure that several motorcycles were necessary for the making of these earth-drawings. A work reenacted in Munich (Germany), in that same year. Playa Works: The Myth Of The Empty, University of Nevada Press, 2002, p.36.